The tent village at Maho Bay is one of the best examples of green travel in the Caribbean. 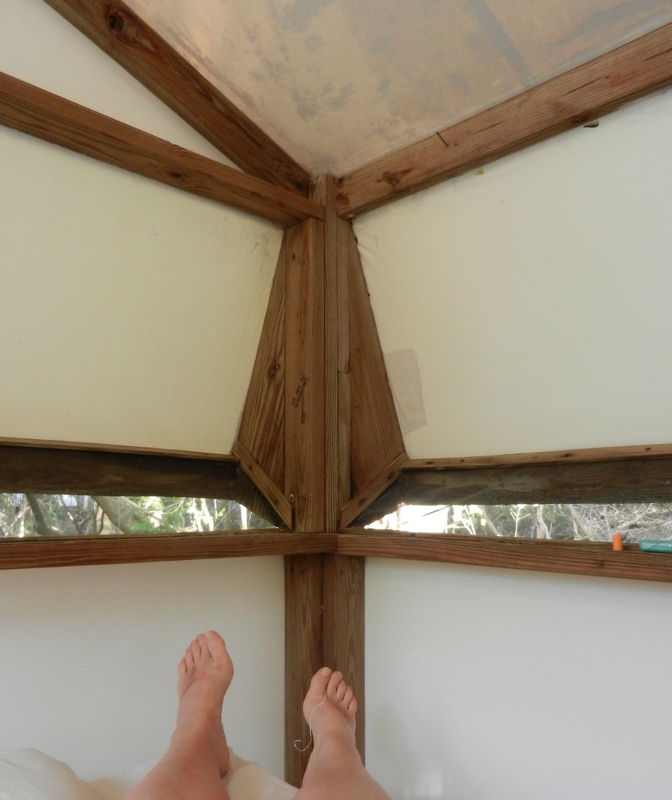 The wood-framed canvas tents surrounded by forest are breezy and light, and have no running water. Most refreshing is the lack of bottled water. We filled our big container with drinking water from a communal spigot everyday, and walked to the bathrooms and showers around the grounds. Recycling is always a problem, especially on an island and it was a relief not worry about where the constant stream of plastic water bottles (so prevalent at tourist destinations) would end up. But I hadn’t expected that glass recycling would be so much a part of what makes Maho Bay a prime example of sustainable travel. It was a main attraction most evenings, and certainly part of the entertainment. 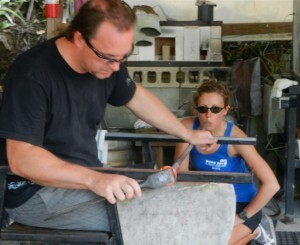 As you know or can imagine, glass blowing is an art that requires many talents – from creativity to courage. Working with dangerous amounts of heat, fire and molten sand takes a certain kind of temperament. Blowing into a long metal tube at the exact moment when the glowing, undefined blob at the other end is the most pliable requires equals measures of faith and experience. 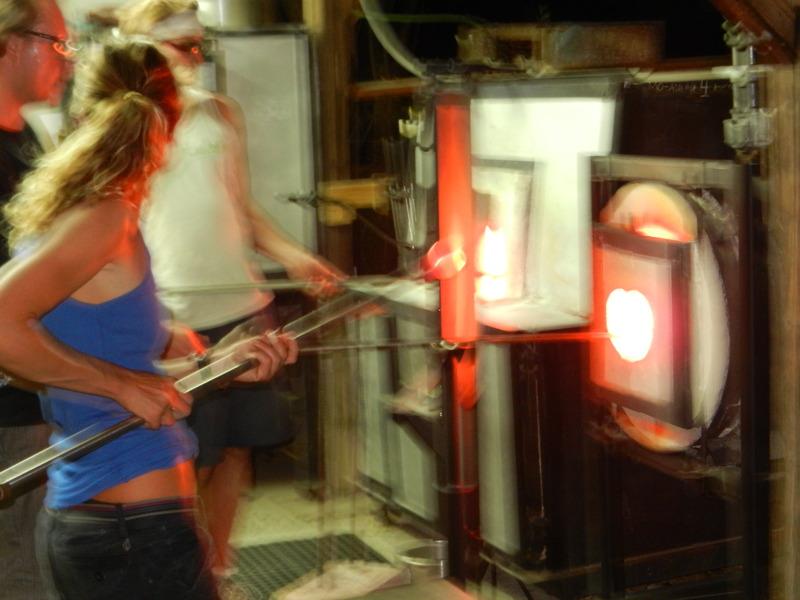 As we sat in the reflected glow of the furnace watching the glass blowers, I learned that knowing how to dance is also part of the skill set. The movements of the three glassblowers were confined to a small radius from the stove’s door with its sporadic roar of flames when opened, to the low table holding the shaping tools across the concrete floor. A slight amount of wiggle room was available on either side. A sink and cooling oven formed the boundary on the back wall, and we, the spectators sat in front and watched. A molten chunk hung to the end of an impossibly long rod each time it was pulled out of the furnace. Getting it to the other side involved a choreography of stepping back, balancing and reeling around so that the chunk ended up 180 degrees from where it started. The process demanded a smooth, fluid movement, one able to convince the unformed glass to stay attached to the other end of the pole. Of course the young, agile women could not open and close the oven door, and so she must also avoid hitting her teammate, the door opener, with the dangerous, unwieldy thing. For his part, the door opener would twist slightly and step back following her lead, the long wand serving as a conductor’s baton. They waltzed around the floor that way for the better part of an evening. The third member of the team was actually a visiting artist sharing his expertise as a temporary Maho Bay resident. Most of the time he sat in an iron arm chair and rolled the pole along the arms, coaxing a design out of the chunk and instructing the young woman when to give it more air. 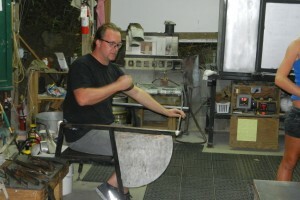 A blowtorch also helped coax the molten sand into a desirable shape. For its part the piece of recycled art rose and fell, was fashioned and refashioned, expanded and contracted and transformed many times before it achieved its final form as a flower surrounded in its own vase. Video: Click here for a quick peek at the action. By the way, the furnace is heated using recycled cooking oil.